Achievements will be removed in the next update (the one after this, which is hopefully in December). 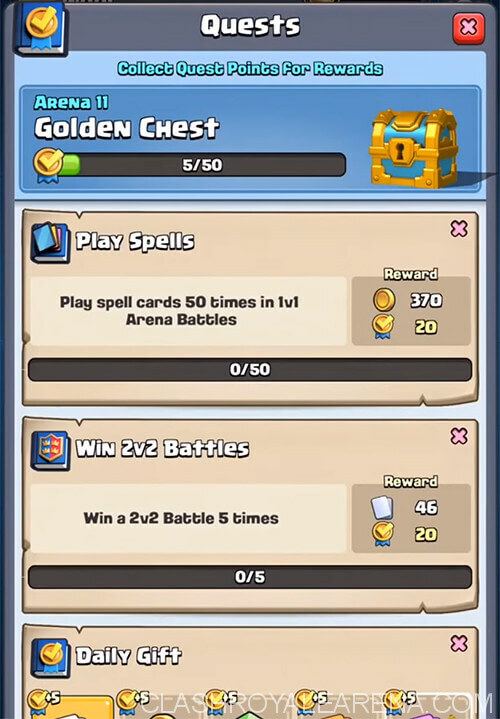 The new Quests button replaced the old Free Chests button. Thus, there will be no longer Free Chest every 4 hours in Clash Royale! There are a lot of Quests in the Quests Database right now but Supercell is still updating it every day. Most of the quests are pretty easy to achieve in general so people can finish them and get the rewards every day. If you do not like the Quest, you can replace it with a different one. A Quest slot will can be replaced once every day. There will be 2-3 Quests open for players at the same time. Once finished, the slot will be filled up with another quest in the following day (18 hours and 21 minutes). It’s not always Super Magical Chest. 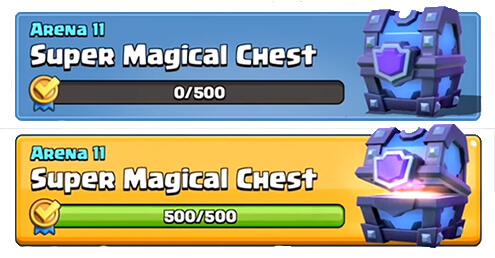 It could be Gold Chest, Giant Chest, Magical Chest, Super Magical Chest or Legendary Chest. Bigger chest requires more Quest Points. Yes, Free Chests somehow survived guys! They will randomly appear in your quest menu like this. You can claim one every 4 hours and get 5 from each chest. We will have a Daily Gift system inside the Quests menu. Every day, you can earn 5 Quest Points by just collecting these. All you need to do is just to open the game and collect the gift every day. Do not skip any day or the rewards will be back to the Day 1. The rotation of the Daily Gift will be changed every reset but you will get the same rewards after all. 5 days in total and you will be back to Day 1.